Even in the larger-than-life world of rock and roll, it was hard to imagine four more different men. David Crosby, the opinionated hippie guru. Stephen Stills, the perpetually driven musician. Graham Nash, the tactful pop craftsman. Neil Young, the creatively restless loner. But together, few groups were as in sync with their times as Crosby, Stills, Nash and Young. Starting with the original trio's landmark 1969 debut album, the group embodied much about its era: communal musicmaking, protest songs that took on the establishment and Richard Nixon, and liberal attitudes toward partners and lifestyles. Their group or individual songs--"Wooden Ships," "Suite: Judy Blue Eyes," "After the Gold Rush," "For What It's Worth" (with Stills and Young's Buffalo Springfield), "Love the One You're With," "Long Time Gone," "Just a Song Before I Go," "Southern Cross"--became the soundtrack of a generation. But their story would rarely be as harmonious as their legendary and influential vocal blend. In the years that followed, these four volatile men would continually break up, reunite, and disband again--all against a backdrop of social and musical change, recurring disagreements and jealousies, and self-destructive tendencies that threatened to cripple them both as a group and as individuals. 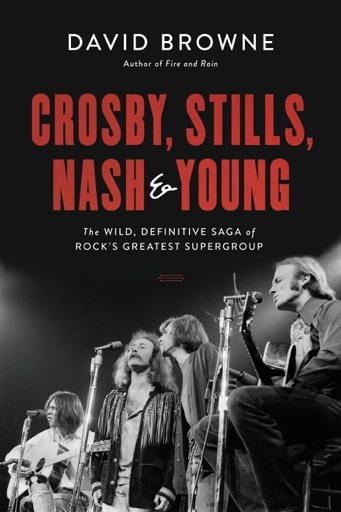 In Crosby, Stills, Nash and Young: The Wild, Definitive Saga of Rock's Greatest Supergroup, longtime music journalist and Rolling Stone writer David Browne presents the ultimate deep dive into rock and roll's most musical and turbulent brotherhood on the occasion of its 50th anniversary. Featuring exclusive interviews with David Crosby and Graham Nash along with band members, colleagues, fellow superstars, former managers, employees, and lovers-and with access to unreleased music and documents--Browne takes readers backstage and onstage, into the musicians' homes, recording studios, and psyches, to chronicle the creative and psychological ties that have bound these men together--and sometimes torn them apart. This is the sweeping story of rock's longest-running, most dysfunctional, yet pre-eminent musical family, delivered with the epic feel their story rightly deserves. Copyright © 2017Books - Audiobooks - eBooks - Cheap Books.